11. If A Complex Social Structure Collapses In The Woods And No One Is Around To Hear It, Does It Make A Sound? 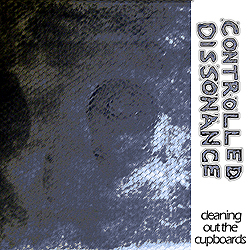 Cleaning Out The Cupboards is a collection of Controlled Dissonance material that has previously been unreleased in album format. The bulk of the material consists of live noodlings and studio oddities from the 2004 – 2006 era of Controlled Dissonance. What I like to refer to as the “Virginia Era”. During those days of Controlled Dissonance, it was not uncommon for me to employ more synths, keyboards and sparse melodic elements. This release also includes the two remixes from 2003 (What Fury remixes) that unofficially kicked off this leg of the Controlled Dissonance adventure.